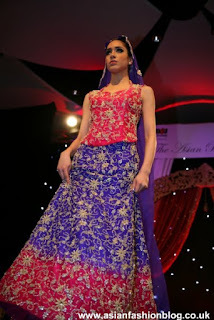 This year's Asian Bride Show in London was held at Wembley Stadium on the 24th and 25th January. The exhibition was put together by the people behind Asian Woman and Asian Bride magazine. Although I didn't attend the London Show, I managed to find some photos from the catwalk, coutesy of Asif Yvette Hair who did the hairstyling for the models. The catwalk show featured the following: Zaryan, Fabric Centre, Huseena Haute Couture, Krishna Sarees, Anisa Shoes and Asian Glitz. All I've got is a lot of photos, so if anyone attended the exhibition and remembers which outfits were by which designers - leave a comment and let us know!! To me I don't see anything innovative or special about any of these outfits. They're all the typical bridal colours and styles. I bet I'm not the only one who's seen outfits practically the same as this elsewhere many many times. I'm not saying there's anything bad about them, I think I'm just used to seeing something that little bit different on the catwalk. Now these two outfits made me sit up a little bit. Firstly I love the colour combination of the first one, I think hot pink and purple go really well together although the embroidery looks a bit too full on. The second outfit has the cutouts on the shoulders which I think look really good. I like all 3 of these outfits, although I wouldn't show off my legs like in the first photo!! Hi, do you know who designed the saris? Does anyone know why the asian bride show at The Venue, Manchester was cancelled? I and my friends had a wasted journey and could have done with a Sunday Lie in had we received prior notice of cancellation. A disappointed fan of Asian Fashion shows! Yep was gutted i had been looking forward to attending the Asian Bride Show all week only to be greeted by closed shutters when I and my friends arrived at The Venue, Manchester! I went to the london show, hoping to purchase some things but couldn't. Most companies don't have a website store. I did find Asian Glitz on the web (saves me a trip into london again). the prurple and pink tie dye lengha is soooo 90's!!! Does anyone know when the next asian bride magazine will be out? HI, I'm thinking of going to the 2010 London show. Is it worth it? I'm a bit worried that Manchester 2009 was cancelled - any ideas why? hey did anyone get a picture of the red gharara worn on this catwalk, and if so whose the designer!!! Anyone knows when and where 2010 fashion show will be held? This is for the Anonymous post's made on the 10 February and 19 March. For designer sarees with ready made innovative style blouses check out www.raazbyrakhi.com. They are UK based which means no long waits on delivery and a full proof refund policy and you can shop with them online. I ended up buying 2 sarees and a suit from them as it saved me the hastle of physically going to the shops and I received my goods within 3 days to my door! All of the sarees and the suit were exactly what I had ordered! A little bit about them, their suits and sarees have more of a vintage feel and the blouses are all ready made as seen on the models. So you dont have the hastle of finding a tailor to make the blouse and put the fall on and all the other bits that you normally would when buying a saree. If you are looking to be different and can pull of certain styles then I would definitely recommend them!